Carl Nord, 34, deceased 5/17/68. He was born 2/13/24, attended Worcester Polytechnic Institute, Worcester, Mass., graduated 1955 numbre one student in his class with a BS in mechanical engineering. Joined Sikorsky at that time as a junior engineer, 1961 named group supervisor-design and analysis of experiments; 1962 was named asst. 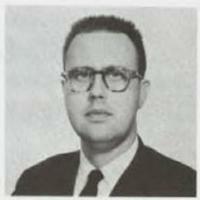 section head of aircraft test engineering; in 1965 he was named asst. chief of test engineering branch, and in March 1968 was promoted to chief of structures and materials, R&D branch. Mr. Nord served as chairman of the Structures & materials committee of the recent AHS Forum. He was a member of ASME, ASTM, Tau Beta Pi, and associate member of Sigma XI.